Since migrating from Europe to Australia, there’s one thing I still can’t cope with too well: Christmas in summer. If I could even slightly afford to fly to other side of the world right now, you’d find me somewhere in the Alps enjoying Christmas in the snow covered mountains as it’s meant to be. Unfortunately for me, that’s not in the cards this year. But hopefully it is for you. If you’re lucky enough to have a trip planned hopping from icy Christmas markets to cold day hiking trail and anything in between, you’ll need some handsome boots that will carry you anywhere. 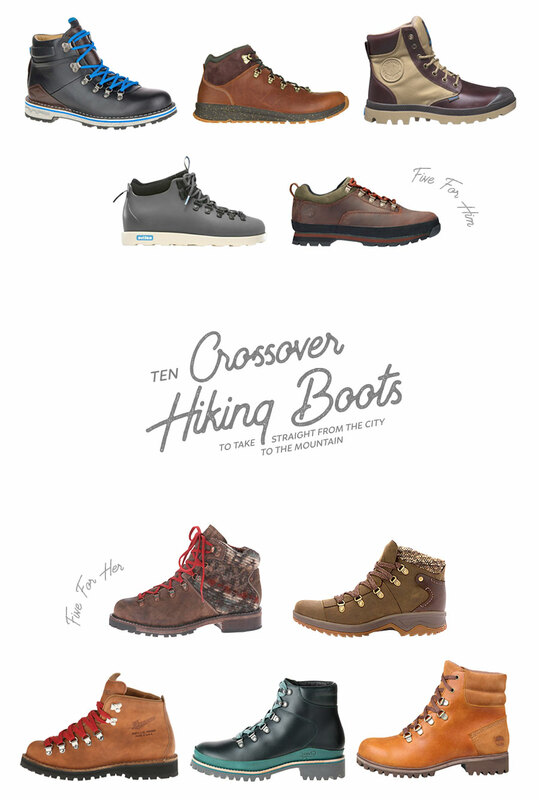 Here’s a small curated collection of 10 Crossover Hiking boots that will do just that. Also comes in a women’s version and make sure to check out the entire Waitsfield collection for lots more crossover options. All Danner boots are pretty freaking stylish and they deserve brownie points for offering a re-crafting service. Palladium used to be the boot of choice of the French Foreign Legion and made aircraft tiers. They know good grip! Native makes all kinds of unisex vegan shoes. There’s also a lot to love about their Jimmy and Rain boots. More of a shoe kind of guy? They also come in a boot and waterproof boot version. Can’t quite figure out why Woolrich wouldn’t put a profile on the heels, but still… could not leave this puppies out. Light hiking only! Doesn’t this funky hiking boot – sneaker looking hybrid look comfy and cushy. Classic! And absolutely suitable for tougher/longer hikes. Not just a sandal company! How cute are these boots? Classic, eco-conscious and waterproof.What more could you want? Now all you need is a good crossover capsule wardrobe and crossover backpack and you’re good to go.